The Shimano Curado DC 150 is a baitcaster with one very unique feature. It contains a digitally controlled braking system. A computer chip inside the reel controls the centrifugal brakes. The chip can make 1000 adjustments per second. Shimano has been developing digitally controlled reels for years. However, this is the first introduction of such a reel into the mainstream north american market. What’s more, reels with this technology are normally very expensive. While the Curado DC is not an cheap reel, it’s much more affordable than other computer controlled baitcasting reels. You may be wondering how this all works. Well, as you cast your lure, the spool accelerates. This acceleration spins a magnet and coil. This creates an electrical current. This current powers the chip and the braking system. As a result, there’s no need for batteries. The whole system is powered by the spinning of the spool. Shimano calls this technology iDC4. The 4 is most likely meant to represent the 4 settings that are available in the Curado DC. The reel has a dial on the front side plate that is opposite to the handle. This dial is how you set your braking preference. Anglers often don’t know what to think when they first try the DC. Right off the bat, they notice the high pitched whirring sound the reel makes. The sound is very cool in my opinion. It’s almost like a tiny jet engine. The sound is caused by the spool spinning up the electromagnet and activating the brakes hundreds of times per second. The computer chips applies the brakes repeatedly. It does this much more efficiently than a human could. Open – Used to open the side plate. 1 – Least Amount of Braking Force. 2 – Next Highest Brake Settings – Good For Braided Line. 3 – Next Highest – Good For Fluorocarbon Line. 4 – Highest Braking . Best For Beginners Or Light Lures. You may think that the DC system is a gimmick that in intended for newbie baitcasters. This is not the case. Experienced baitcasting reel users will be thrilled by the improvements in accuracy and distance you can get out of a DC reel. As for beginners, the reel is great if you’re new to baitcasters and trying to avoid backlash. When you set the DC to max braking, it will be very helpful. Normally, when you cast, thumb pressure is used to prevent the spool from over spinning. This is especially true as the lure is at the end of the arc and when it hits the water. As the lure nears the water you lightly apply thumb pressure to slow down the spool. If the spool were to continue to spin after the lure hits the water, you’ll get a birds nest. With the Curado DC, you hardly have to apply any thumb pressure at all. If you’re looking for a great rod to pair up with the Curado DC, check out the Shimano Expride line of rods. These rods are a bit on the pricey side but they have great sensitivity. They also come in various lengths and actions to suit your needs. If you’re looking for something a bit more reasonable priced, check out Dobyns rods. Specifically, take a look at the colt series. These rods have great reviews and won’t break the budget. Staying with the Dobyns brand, you can check out the Fury series for a step up from the Colts. They’ll give you more sensitivity with only a slight bump up in prices. 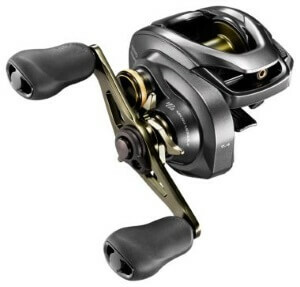 The Curado DC comes with many existing Shimano Technologies. Micro Module Gears feature gears with smaller teeth. This provides for more contact points and a smoother feel. Cross Carbon drag provides a greater drag range and the smoothest Shimano drag available. Hagane body means that the body is made from cold forged metal alloys for greater stiffness. The reel is available in 3 models. The Curado DC 150, DC 150HG and DC150XG. 20 pound Braid / 150 yards. 30 pound braid / 135 yards. 40 pound braid / 105 yards. 10 pound mono / 120 yards. 12 pound mono / 110 yards. 14 pound mono / 90 yards. The weight is 7.8 ounces. It comes with 6 bearings plus 1 roller bearing. The drag maxes out at 11 pounds. You can get the Curado DC in 3 gear ratios. The regular DC has a 6.2:1 gear ratio. The DCHG has a 7.4:1 gear ratio. And the DCXG has a 8.5:1 gear ratio. The DC is also available in a left handed model with is designated as the DC151. You can find out more on Shimano’s Site.